Tree Wings Studio: My Work is Featured on Polymer Clay Chameleon! 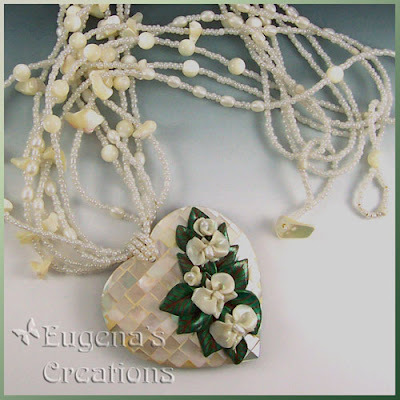 I first discovered the beautiful work of Eugena Topina early last year in a Fire Mountain Gems catalog. Her necklace Bridal Orchids was a contest finalist. There were no materials listed but I just knew it had to be polymer clay. 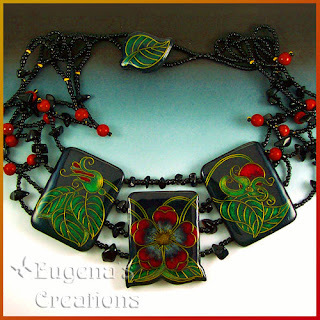 Using the link in the catalog, I came to EugenasCreations.com. I was right, her work is polymer clay and some of the best I've seen! And then on February 1st of this year, Eugena launched Polymer Clay Chameleon, a special blog featuring not her own work, but the work of other polymer clay artists who sold their art on Etsy.com. Reading about the various artists and their art became a part of my early morning routine. So you can imagine my surprise when yesterday that artist was me! Thank you so much Eugena! 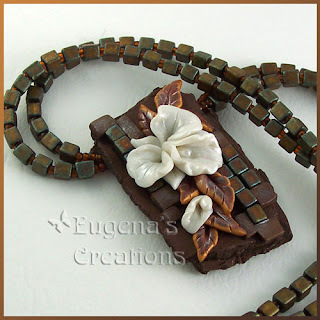 My two favorite necklaces by Eugena - Sculpted Orchids and Wild Rose.